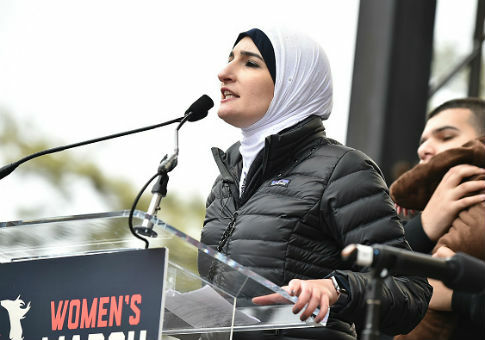 Prominent Palestinian-American activist Linda Sarsour, a leader in the feminist movement, said in an interview published Monday that Zionists cannot be feminists. Sarsour, executive director of the Arab American Association of New York, spoke with Collier Meyerson of the Nation about the relationship between feminism and Zionism, the movement to reestablish and maintain a Jewish nation in Israel, the Jewish people's ancient homeland. Sarsour was dubbed a "champion of change" by the Obama administration and has been active in the feminist movement, serving as co-chair of the Women's March on Washington the day after President Donald Trump's inauguration and helping organize the "Day Without a Woman" strike earlier this month. During the latter event, Sarsour spoke at a rally on International Women's Day in New York City. She was later arrested for disorderly conduct. Meyerson asked Sarsour about a recent op-ed in the New York Times in which Emily Shire, the politics editor for Bustle, asked, "Why should criticism of Israel be key to feminism in 2017?" "When you talk about feminism you're talking about the rights of all women and their families to live in dignity, peace, and security," Sarsour told Meyerson. "And Israel is a country that continues to occupy territories in Palestine, has people under siege at checkpoints–we have women who have babies on checkpoints because they're not able to get to hospitals [in time]." Sarsour, who once glorified child terrorists fighting against Israelis, suggested that support for Israel is incompatible with feminism. "It just doesn't make any sense for someone to say, "Is there room for people who support the state of Israel and do not criticize it in the movement?" she said. "There can't be in feminism. You either stand up for the rights of all women, including Palestinians, or none. There's just no way around it." Sarsour also praised the Boycott, Divestment, Sanctions movement, which seeks to wage economic war on Israel, as a natural part of feminism. "What's interesting here is that feminism is a movement and BDS is a tactic. That's the first thing Shire doesn't understand. But that's the reason why BDS makes sense within the feminist movement, or really within any social justice movement," Sarsour said. "BDS can be used in the feminist movement to demand change and demand more rights for women," she added. "BDS has been used as a tactic to raise awareness for Palestinian people, including women and their children." Sarsour has raised controversy in recent years for criticizing Israel and Zionism. In 2012, she wrote that "nothing is creepier than Zionism," equating it with racism. She has also called Israeli Prime Minister Benjamin Netanyahu a "waste of a human being" and a "bigot." Netanyahu is a waste of a human being. Last year, Sarsour attacked an African-American pro-Israel activist because she "forgot where she came from." Sarsour has often used her Twitter account as a platform to express her views about the Israeli-Palestinian conflict. In 2015, she appeared to present a Palestinian child holding rocks as "the definition of courage." "Palestinians often hurl rocks and other objects at Jews and Israeli security personnel," the Washington Free Beacon reported at the time. This entry was posted in Issues and tagged Anti-Semitism, Israel, Women. Bookmark the permalink.